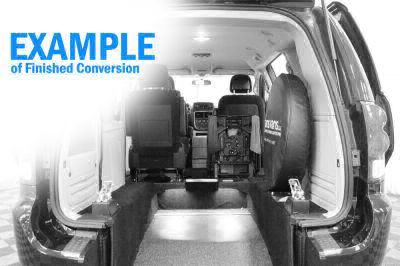 All of the wheelchair vans advertised on this section of our website come with brand new lowered floor conversions and are priced thousands less than other mobility dealers and manufactures. Used handicap accessible vans with over 60K miles come with a 3 Year or 36,000 Mile conversion warranty and have been through our 134 point quality assurance program. Used, or Certified Pre-Owned vehicles with New Wheelchair Accessible Conversions are one of the greatest ways that you can get the most bang for your buck with your purchase of a new handicap van. AMS Vans puts its Used Vehicles through its 134-point inspection before and after the conversion process in many cases. We want to ensure that you get the best experience possible from your AMS Van. All of these vehicles will come with a 3 Year / 36,000 Mile Conversion Warranty, and in many cases a 12 Month / 12,000 Mile Powertrain Warranty will also be available through AMS Vans. Showing 30 of 250 vehicles that match your search. More and more families are choosing AMS Vans for their wheelchair accessible vehicles. The reason that we're becoming so popular is that we care about what we do, and it shows in every step of our customer service. Today, handicap vehicle information is readily available literally at one's fingertips via the internet ... it is possible and easy to find and customize a handicap vehicle specifically to meet one's individual needs.